Come in and smell the exotic scents of freshly roasted beans and a selection of flavors that go perfectly with any food. Our beans are roasted around the clock to guarantee great flavor and aroma in every cup. Perfect for dinner parties, a host gift, a gourmet basket, corporate gifts or just for you on that cozy, lazy weekend morning. The perfect gift for dinner parties, host gift, gourmet basket, or to simply treat yourself to the best coffee. Our local roaster uses the highest grade Arabica coffee beans accompanied with the highest quality flavorings. Our coffee ensures that you get the freshest cup of coffee to savor. All decaffeinated coffees are Swiss Water Processed, 100% free of any chemicals. 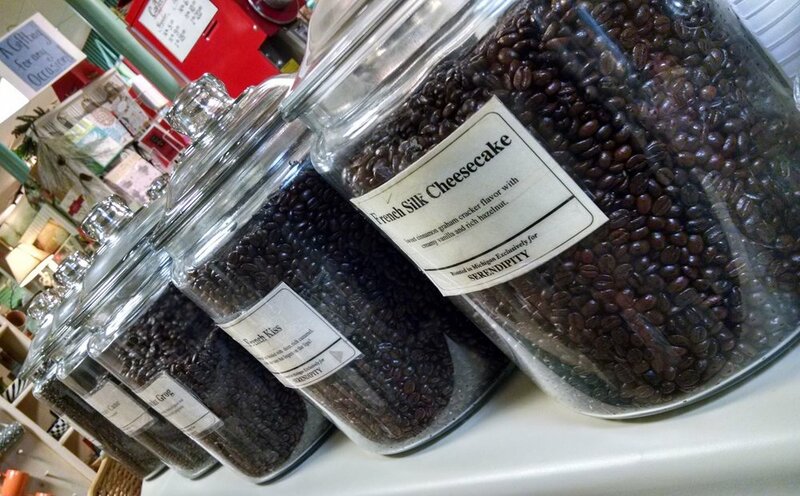 Choose from a variety of flavors in whole bean or ground to your personal specifications at no additional charge. Almond Coco: Rich chocolate, toasted almond, and hints of coconut just like the candy bar Almond Joy. Butter Rum Cream: Buttery rum with a just a touch a cream. DECAF AVAILABLE. Blueberry Cinnamon Crumble: Just the aroma will remind you of fresh blueberry muffins straight from the oven! Coffee Cake: You can smell it baking in the oven! A hint of nuts ginger, orange, cinnamon and spices. Cookie Doodle: Just like a popular old fashioned cookie! Light cinnamon, with hazelnut and vanilla. DECAF AVAILABLE. Dutch Chocolate Mint: The perfect blending of mint and chocolate. Eighty Niner: The delicious and irresistible flavors of fudge, hazelnut, irish cream, and amaretto. French Kiss: Imagine warm creamy custard blended with caramel. It is a taste that lingers on the lips. DECAF AVAILABLE. French Silk Cheesecake: Cinnamon coated graham crackers with vanilla custard and sprinkled with ground hazelnuts. DECAF AVAILABLE. Hazelnut: Rich hazelnut taste and one of our most popular flavors. DECAF AVAILABLE. Highlander Grog: Irish cream with a little spicy kick of butterscotch. Irish Cream: Rich butterscotch, sweetened cream, and mellow whiskey notes. Jamaican Me Crazy: A cool blend of caramel, kahlua, and vanilla. DECAF AVAILABLE. Mackinaw Island Fudge: a thick chocolate fudge flavor that melts in your mouth. Maple Pecan: Lots of sweet creamy maple flavor with a touch of pecans. Pumpkin Spice: Fresh baked baked pumpkin pie in a cup. DECAF AVAILABLE. Roasted Chestnut: A very light, nutty taste of fresh roasted chestnuts. DECAF AVAILABLE. Tiramisu: Chocolate dipped, cream filled lady fingers with a dusting of espresso powder. Totally Nuts: True nut flavor from the perfect blend pecans, hazelnuts, and almonds. DECAF AVAILABLE. Traverse City Black Cherry: Straight from the best cherry orchards in Northern Michigan. The delicious taste of fresh picked cherries. Vanilla Nut Cream: A great blend of vanilla, nuts and cream. DECAF AVAILABLE. Breakfast Blend: Mix of four beans roasted light and dark makes for a slightly stronger taste. Perfect for the cup every time. DECAF AVAILABLE. Colombian Supremo: Rich well balanced and deep with a mellow body. A very popular coffee around the world. French Roast: Strong, tart and spicy but lighter than our Italian Espresso. Often blended with milder coffees to give them a fuller and deeper taste. Hawaiian Blend: 100% Hawaiian coffee blended with Central American for aromatic smooth coffee that is very similar to pure Hawaiian coffee. Italian Espresso: Primarily for espresso, it is our darkest roast with actual carbonization of the bean. Serendipity Blend: We combine beans from Costa Rica and Peru to make this a very flavorful and smooth cup of coffee. DECAF AVAILABLE. Click "SHOP NOW" to purchase some of our FABULOUS coffee!